It’s a GROWING trend – Real estate owners transform parking lots into solar energy generators. From hospitals, shopping districts, airports, to corporate complexes, city projects, and like commercial developments, “solar farms” are now finding their way to the everyday locations that we work, eat, play, and stay. Your solar provider such as NRG (Here) will answer important questions. Overall the facility owner receives a natural form of renewable energy provided by systems such as the NRG energy solutions, while your patrons receive the relieving benefits of parking shade where solar canopies have been installed. 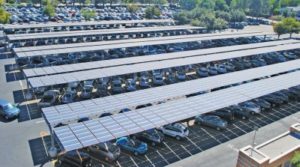 Don’t let limited and or heavily impacted parking lots stop you from implementing an NRG or like solar installation system. SVS Parking Company has been working with companies such as NRG, Kaiser Permanente, and other Fortune 500 corporations to implement simple parking solutions that ensure your patrons, guests, members, and or employees are able to continue their daily fundamentals, while a solar project is planned, mobilized, and fully completed. 1 – As the first step an onsite assessment is completed by SVS Parking Company with your solar contractor, and facilities personnel. Historical parking counts are gathered to assess daily impact, and traffic peaks. Parking solutions such as park-assist programs, off-site parking (only if needed), and shuttling are considered as a last case resort. 2 – Following final parking map compilation, and approvals, coordination remains between your solar provider, contractors, and you (the client) to ensure your daily business activity is not stifled as the project begins. 3 – Parking teams that have been trained in impact parking, park-assist, hospitality, and leadership are formed to be your regular daily team on site. All systems, labor, insurance, and materials are provided by SVS Parking Company. The use of solar canopies continues to grow in popularity across the United States as companies and municipalities are capitalizing on the use of renewable energy to lower their energy costs and rely less on the power grid. 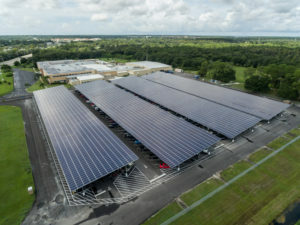 Parking lots provide ideal locations for the canopies, since a study conducted by the U.S. Department of Energy’s National Renewable Energy Laboratory determined that only 26 percent of small buildings have rooftop areas suitable for a rooftop photovoltaic (PV) system. The analysts conducted a study of 140 cities during a 4-year period, the research found that creating solar canopies “over open spaces such as parking lots” has “immense potential,”. The use of solar was started on rooftops, but more companies and government agencies have started taking advantage of existing space, such as the addition of solar panels at the parking lots for the San Francisco International Airport in 2013, healthcare facilities such as Kaiser Permanente, grocery stores such as the Whole Foods, and many more have installed panels above their parking.